Looking at the picture of Slovakian Sharzall and seeing gothic in reference to the band, one might think looking at those bloody and ugly faces gothic here is not all about sorrow and self-loathing. 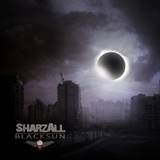 The cover here predicts the book rather accurately as Sharzall's debut Black Sun demonstrates. The intro Prologue may sound like an ominous dark classical overture, but starting with Hell Quit Black Sun takes on a much nastier tone. Hell Quit establishes Sharzall pushing the edge to their guitars, keyboards sprinkled in, but not prominent, the song has definitive shrill attitude emanating from it. With vocals being almost spoken gurgles, Sharzall certainly have an uncomfortable feeling to their goth, sadistic torture actually coming to mind when listening to Hell Quit. Frontline and title track are almost punk rock more than they are goth, only Love is on the Ground standing out both for its title and appropriate cleaner poppish tone. On the opposite, Piker Man is wolfish, observing someone's pain with a smirk. Song after song hitting about the same territory, I would prefer to hear more tunefulness from the album. Whereas guitars do their best to stitch the fabric over, percussion does its best to break it up (Crisis). Flowy and melodic are also not attributes I would ascribe to Black Sun much. Sharzall won't become one of my most interesting recent discoveries, too much show-off for the sake of it here, but if you are looking for a more pissed off Crematorium, or wanted Sentenced to go punk rock instead of saccharine melodies before they folded, Sharzall may have something to offer. Especially if you like your gothic rock punky, not about dying and wilted flowers, but rather about watching someone’s misery and possibly laughing in the process.